As suspicions mount about possible Chinese government influence being exerted on Canadian campuses, Chinese officials have denied involvement in a campaign of online vitriol against a Tibetan activist elected student president at the University of Toronto's Scarborough campus. Since her victory less than a week ago, 22-year-old Chemi Lhamo says she has been the target of fervent anti-Tibet harassment online — something at least one former intelligence officer says is a tactic consistent with China's strategy of undermining political dissent. But in a statement released Friday, China's Consulate General in Toronto said it only learned of the online attacks against Lhamo from the media. However, the statement doesn't condemn the views expressed by thousands of commenters who have swarmed Lhamo's social media accounts in recent days. "It is believed that this is an entirely spontaneous action of those Chinese students based on objective facts and patriotic enthusiasm," the statement says. "The Chinese government firmly opposes anti-China separatist activities by 'Tibet independence' activists who are plotting to split Tibet from China [and] the move of any country or organization to provide support or convenience of any kind to 'Tibet independence' activities." The conflict over Tibetan sovereignty is centuries old, with China maintaining that the region has been part of it since ancient times. Most Tibetans have long argued the region was historically independent and should be so once again. 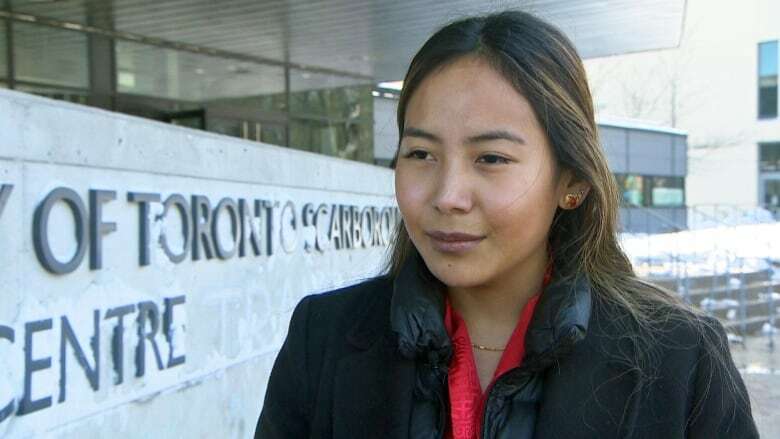 Lhamo, a Canadian citizen of Tibetan origin, is a member of the group Students For a Free Tibet, which supports the fight for an independent Tibet. She has also spent several years working with the Tibetan community in Toronto's Parkdale neighbourhood. Following her election, Lhamo found herself on the receiving end of a torrent of pro-China comments, some of which were threatening, she said. A petition calling on Lhamo to step down quickly gathered thousands of signatures. And there was also message on the Chinese mobile service We Chat making the rounds, calling on Chinese international students to stop Lhamo from becoming president. Michel Juneau-Katsuya, former senior CSIS official for the Asia-Pacific region, told CBC News the prospect that Chinese student groups campaigning against Lhamo could be receiving direct support from China was "beyond plausible" in his view. Both Juneau-Katsuya and Lhamo have said they would welcome the University of Toronto probing the source of the campaign of vitriol against her. So far, the school has said its focus has been on ensuring student safety. The Chinese consulate says it hasn't been contacted by the university. 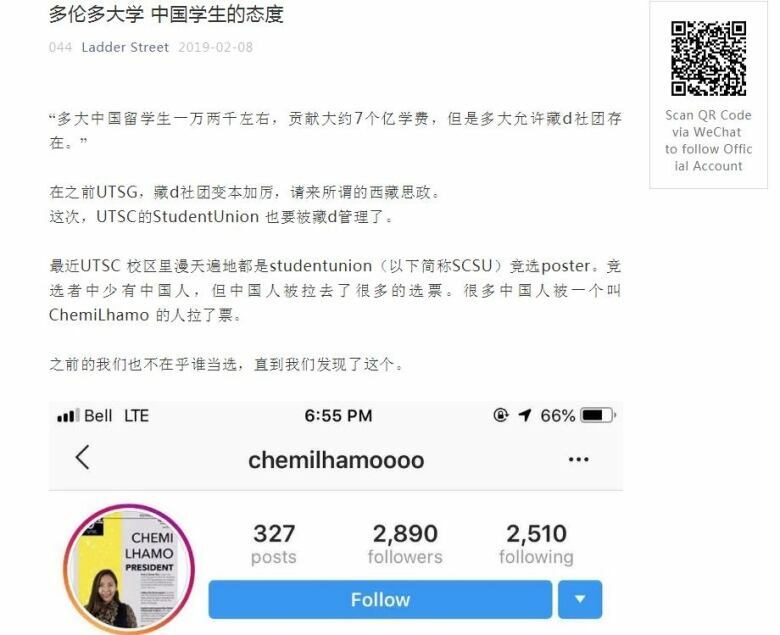 The backlash against Lhamo is one of two recent episodes that have prompted concerns about possible Chinese government influence in campus politics in Canada. A presentation by an activist who is critical of the Chinese government's treatment of Uighurs was disrupted at McMaster University in Hamilton, Ont., earlier this week. The Uighurs are an ethnic minority of Turkic Muslims who have spoken out about mass detention and surveillance in the western region of Xinjiang. 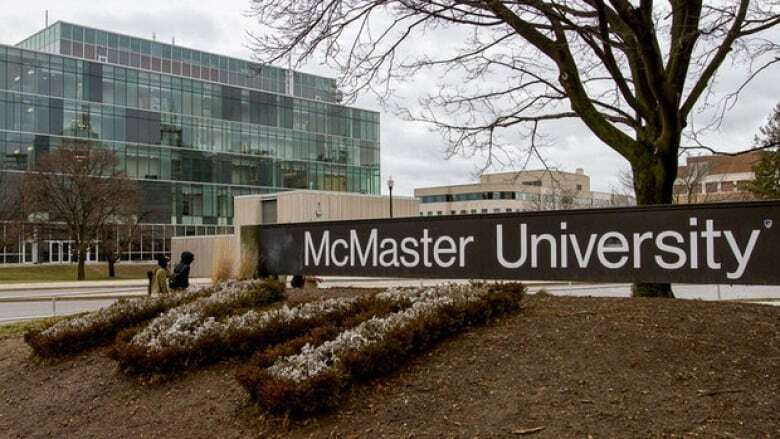 McMaster University says it is looking into what happened, but Rukiye Turdush is adamant that the students who filmed and shouted during her talk did so under the direction of the Chinese government. Global Affairs Canada has not responded to requests for comment about whether it is taking steps to investigate the possibility of Chinese government influence on student groups operating on Canadian campuses. But that's exactly what a former Canadian ambassador to China says he'd like to see the federal government do. "Chinese interference among Chinese student groups has been noted for some time," said David Mulroney, Canada's former ambassador to China from 2009 to 2012. "I would hope that Ottawa is calling some Chinese diplomats to ask about this. "It's entirely inappropriate but unfortunately it's a fact of life given the fact that China monitors how it's perceived in the West."